We all have bad days. The reality is that it may not really be a bad day. In fact, when you examine them, bad days are more like bad moments. Despite what we may call them, these days do and can affect how we think and act behind the wheel. The change of mood can make us aggressive or angry as we drive. Angry drivers become menaces on the road, for themselves and for others. As drivers, do we really understand the consequences of this behavior? Being an angry driver, even for a few moments, seriously impairs your ability to make clear, logical driving decisions. The anger you’re experiencing becomes your focus and driving safely takes a backseat, so to speak. But what happens when this anger festers inside you? Can it escalate and cause larger issues? Yes, it can! There is a huge difference between being an angry driver and being a road rager. The main difference is follow-through. An angry driver may get frustrated and experience distracting thoughts about other road users. But those thoughts aren’t acted on. However, the road rager is going to do something about what caused the anger. Let’s start at the beginning. Do you often find yourself yelling at other road users while you’re driving, even though what they did may not have directly affected you? Are you judgmental to others’ driving, walking or cycling choices? Do you punish other drivers by driving somewhat aggressively toward them or by honking long and loud after they’ve made a mistake? These are all signs you’re on track to becoming a road rager. Now is the time to put a stop to it before it’s too late. 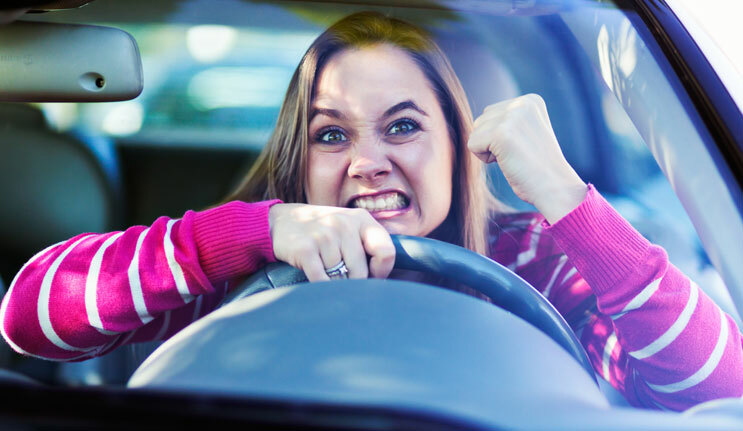 Road raging may be caused by the anger you feel toward yourself. You’ve either done something you wish you hadn’t, or you didn’t do something you knew you should have. Either way, take a deep breath and move on. You can’t change the past. You can only learn from it. Through planning is a good first step to minimize the occurrence of road rage. Leave for your intended destination well in advance to allow time for unexpected delays caused by things such as heavy traffic. If you know you’re running late, it may make you a little short-tempered with everyone and everything in your vicinity. One thing to remember: you can’t travel any faster than the traffic around you. Yelling at the driver ahead of you or tailgating a vehicle won’t make all the other drivers move any faster. Again, take a deep breath. You’ll still get there. It’s plain and simple. Road rage within our communities is 100% avoidable. Learning how to deal with it needs to happen before the rage starts. Once you’re feeling the anger or rage behind the wheel, common sense will never happen. One way to remain calm while driving is to avoid taking the actions of other drivers personally. There are numerous reasons why people drive the way they do. Sometimes people are simply poorly-trained drivers. Often people are distracted. Other times subpar driving could be the result of inclement weather or inferior road conditions. Sometimes people simply make mistakes. Also, never retaliate against a road rager. Drivers have been seriously injured or killed as the result of road raging. You’re just as guilty as they are if you act like them. Many road ragers receive criminal charges, regardless of who started the incident. If someone is raging toward you for whatever reason, avoid making eye contact with them and refrain from engaging in dialogue with them. Not observing this advice may fuel even more rage. Ignore road ragers and stay focused on the important task of driving. Getting entangled with a road rager may also serve as a distraction to you, which could lead to other serious driving issues, such as collisions, and serious injuries and/or fatalities. I think we’ve all seen drivers annoyed when the driver ahead of them stops at a red light when the rager behind felt they should have gone through the intersection. You know very well the road rager will be all over that driver once the light turns green—probably honking within a fraction of a second of the light changing. If you’re the lead driver and the road rager is behind you, you may want to change lanes as soon as possible to let them pass. If there is no other lane to use, perhaps use the shoulder or a gas station or parking lot to let them get around you. It’s not about being a passive driver. It’s about being a smart driver. Okay, so let’s say you’re having a bad moment or bad day. Anything that happens that remotely affects you, you seem to take it the wrong way, including while driving. A lot of us have been there. Here’s what you can do to reduce or eliminate road raging. If you’ve had a bad day, while parked, put on your favorite music. Then head off down the road. Another useful technique is to close your eyes for a few minutes. Take a few deep breaths. This will slow down your heart rate and put you in a more relaxed mood. Then start the vehicle and head off to your destination. If the cause of your stress is at home or work, do your best to leave it there as you get into your vehicle. Leaving those problems where they originated will assist you in remaining calm while behind the wheel. It’s always a good idea to take a few moments before you begin to drive if you’re feeling angry, annoyed or grumpy so you can ease tension and clear your mind of those issues. We’re all entitled to get annoyed, even angry at times. It’s time to pick your battles and make a clear choice of when and where it’s okay to allow these emotions to manifest themselves. If your mind is wrapped up in anger, give yourself a few extra moments before driving away. Driving is typically the most dangerous thing each of us does and we do it often, if not every day. Give yourself and those around you the best chance at staying safe. Manage your emotions. There’s too much at stake not to.